CALL US! Bulldog bail bondsman knows the process - the sooner we know, the sooner we can have your loved one released. We are knowledgeable with the bail bonding process and can immediately go to work to on your behalf. Every day our bail bondsman is in Richmond, Henrico, Chesterfield and other Virginia jails standing before the magistrate and releasing clients. Let us work for you.! WE NEED TO KNOW THESE THINGS... In order for our bail bondsman to have someone released, we will need to know their 1)Name 2)Where they were arrested. and 3) How much is the bail. Having this information is helpful for our bail bondsman to release someone quickly from jail, but if you don't have all the information yet - still call! Many times the bail bondsman can help find that information for you and begin the bail process. HOW MUCH WILL A BAIL BOND COST? Virginia bail bondsmen are regulated by the Virginia Department of Criminal Justice Service (DCJS). Virginia law requires that bail bondsmen charge a minimum of 10% of the bail but no more than 15%. HOWEVER, we do have affordable payment plans that allow us to take as little as 5% of the bail, and the remainder placed on a affordable payment plan. Be cautious of bail bondsmen who say they charge less than 10%. They may be violating the law or have other hidden charges! HOW LONG WILL THE BAIL BOND PROCESS TAKE? Once the bail has been set by the magistrate, our bail bondsman can IMMEDIATELY start to process the bail bond. Our bail bondsman can post bond in less than an hour, but sometimes that time can be delayed depending on how busy the jail is. Bulldog Bail Bonding will be committed till the bail bond process is complete! Courteous, Professional Service - when you are in a difficult situation, you deserve to be treated with respect and dignity! We are available 24/7 - We may be groggy, but our bail bondsman is active at all times of the night and day. Our phone is always available, and we take collect calls from any jail. We are a TEAM - We work together to provide excellent service to all who call. If one of our bail bondsman is in Richmond and you need a bail bondsman in Henrico.. it's not a problem. Bulldog can meet the need! 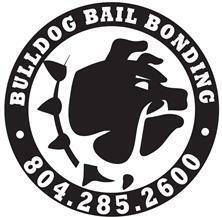 Large Service Area - Our Bulldog bail bonding company can service ANY Virginia Jail. Our more common localities are Chesterfield, Henrico, Hopewell, Hanover, Richmond City, .. we can be there! And why does Bulldog bail bonding do what we do? It's about passion. A person who is only accused of a crime is innocent until proven guilty. Why should they have to spend any time in jail? It's your constitutional right to be free until PROVEN guilty. That's what bail bonds are all about. We are proud to be a part of a Constitution which guarantees constitutional rights to all Americans. Call BullDog Bail Bondsman Richmond Va. Bail Bonds for Chesterfield County Jail in Chesterfield VA. Our services are 24 hours, and we service Richmond & Tri-City areas and Central Virginia. Call today to speak with an agent to answer all your bonding questions! Bail Bonds for Riverside Regional Jail in Prince George VA. Our services are 24 hours, and we service Richmond & Tri-City areas and Central Virginia. Riverside Regional serves Colonial Heights VA. Call today to speak with an agent to answer all your bonding questions! Bail Bondsman for Richmond City Jail in Richmond Virginia. Our services are 24 hours, and we service Richmond & Tri-City areas and Central Virginia. Services include traffic, misdemeanor, criminal, and appeals. Call today to speak with an agent to answer all your bonding questions! Bail Bondsman for Pamunkey Regional Jail in Hanover, Virginia. Our services are 24 hours, and we service Richmond & Tri-City areas and Central Virginia. Services include traffic, misdemeanor, criminal, and appeals. Call today to speak with an agent to answer all your bonding questions!